ACEP's Emergency Department Directors Academy (EDDA) Phase II Course is organized by ACEP's Emergency Department Directors Academy (EDDA) and will be held from Apr 29 - May 3, 2019 at Omni Dallas Hotel at Park West, Dallas, Texas, United States of America. This CME Conference has been approved for a maximum of 28.25 AMA PRA Category 1 Credits™. Course Description Phase II: Effectively Manage an Emergency Department As you strive to run an effective ED, many people may play a role in your success as ED Director. Phase II focuses on bringing your management team together to build teamwork and develop effective plans for your ED. Who From Your Management Team Should Attend Phase II with You? • ED Directors • Medical Directors • Nurse Managers • Nurse Directors • Charge Nurses • Clinical Nurses • Chief Residents • Residency Directors Phase II features interactive breakout sessions and courses with topics on: • Crisis communications • ED information systems • EMTALA • Leading and inspiring teams • Patient flow, service and safety • Improving performance Additional details will be posted as soon as they are available. American Society of Breast Surgeons (ASBS) 20th Annual Meeting is organized by The American Society of Breast Surgeons (ASBS) and would be held during May 1 - 5, 2019 at Hilton Anatole Dallas Hotel, Dallas, Texas, United States of America. CurePSP Caregiver Retreat is organized by CurePSP and will be held on May 04, 2019 at Texas Health Presbyterian Hospital Dallas, Dallas, Texas, United States of America. Conference Description : It is a day dedicated to learning, relaxation, and stress management techniques for those who look after loved ones with neurodegenerative diseases. Most often, these are the people who are overlooked and overwhelmed. CurePSP encourages and organizes activities that foster face-to-face communication, exchange of ideas and information, and interaction for comfort and the mutual benefit of caregivers on the same journey. For this event, we bring in experts to discuss meditation, change, nutrition, stress, mindfulness, communication, and much more! Additional details will be posted as soon as they are available. Basic Botox Training & dermal filler training course is organized by MedAesthetics Training, LLC and will be held on May 04,2019 at Hilton DFW Lakes Executive Conference Center, Dallas, Texas, United States of America. CME Credits: This CME Conference has been approved for a maximum of 9.50 Prescribed credit(s) by the American Academy of Family Physicians. Physicians should claim only the credit commensurate with the extent of their participation in the activity. Course Description : Personalized Attention Each Botox and dermal filler training course has a maximum of 8 attendees. This intimate course setting allows the instructor to spend individualized time with each attendee. 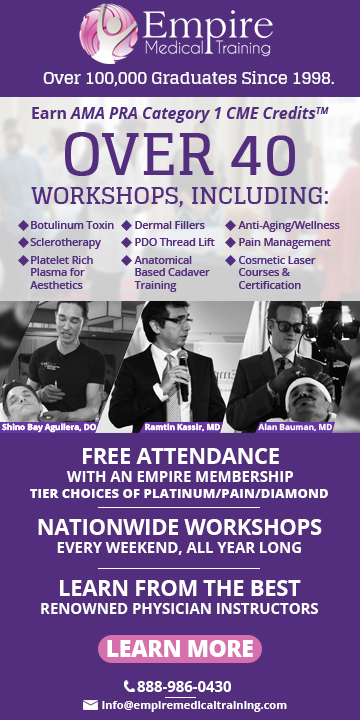 The instructor is available to answer attendee’s questions and to share years of experience with botulinum toxin and dermal filler products and procedures. Attendees will learn the pearls gained from the instructor’s experience including seeing what works, having off-label expertise, and ensuring client satisfaction. Didactic Session : The Botox and dermal filler training course begins with an intensive and thorough lecture session where you will: • Review facial anatomy • Discuss the history and pharmacology of Botox Cosmetic, Dysport®, Xeomin and dermal fillers • Go over reconstitution techniques for Botox Cosmetic, Dysport and Xeomin • Understand client selection and preparation • Learn the indications, contraindications and treatment techniques for each area and/or product • Examine possible side-effects and after-treatment protocols Learning Objectives: • Discuss the goals of aesthetic procedures including the types of aging and how the skin changes as it ages • Increase knowledge of facial anatomy in reference to injectable procedures including facial muscles and understanding the layers of the skin • Information on the history, mechanism of action, and safety of Botulinum Toxin-A • Discuss the proper preparation and reconstitution techniques for Botulinum Toxin-A • Examine Botulinum Toxin-A dosage and injection techniques for the glabellar region, frontalis, bunny lines, crows feet area, brow lift procedures and DAO injections • Understand the use and role of dermal fillers • Analyze the hylauronic acid classification methods, common areas of use and depth of injection for hyaluronic acid dermal fillers • Understand the types and uses of the most common hyaluronic acid dermal fillers in the United States • Examine dermal filler techniques and injection methods for lip enhancement, lip augmentation, marionette lines, nasolabial folds and midface volumization. • Discuss types of anesthesia • Understand common complications that may occur with Botulinum Toxin-A and/or dermal filler injections and how to manage these complications with proper safety protocols • Evaluate correct patient selection criteria, the importance of medical history review and elements of a successful aesthetic patient consultation • Lean how to explain pre-care, post care, risks and side-effects and from there create a comprehensive treatment plan • Establish and exhibit successful skills in performing live model consultations • Demonstrate correct injection methods and techniques for Botulinum Toxin-A and dermal fillers Earlybird Deposit ($1,525.5 - 50% due now, 50% prior to seminar) Additional details will be posted as soon as they are available. Hyper Oncology is organized by Churchill Consulting and will be held from May 08 - 10, 2019 at The Network Bar, Dallas, Texas, United States of America. Description: The first training seminar of its kind developed to give attendees access to the top oncology experts in the industry. In its first year, this event presents an opportunity for decision-makers and reformers to reimagine processes and reshape the future of oncology. Benefits: CEU Hours ARRT - 21.5 hours ROCC - 6 hours AAPC - 18.5 hours AHIMA - 21.5 Additional details will be posted as soon as they are available. Mastery of Chiropractic Principles and Practice is organized by International Chiropractic Pediatric Association (ICPA) and will be held from May 11 - 12, 2019 at Hyatt Place Dallas / Las Colinas, Dallas, Texas, United States of America. The target audience for this medical event is open to chiropractors and students: 5th quarter/4th trimester or higher. This Conference has been approved for a maximum of 12 hours of continuing education credits. Course Description: Explore the multifaceted dynamics of chiropractic family wellness practice. The course will provide you with the tools and systems to create a successful practice congruent with the traditional values of chiropractic philosophy in a contemporary application of chiropractic technique. You will be challenged to develop mastery in every aspect of practice with emphasis on the care of infants and children. 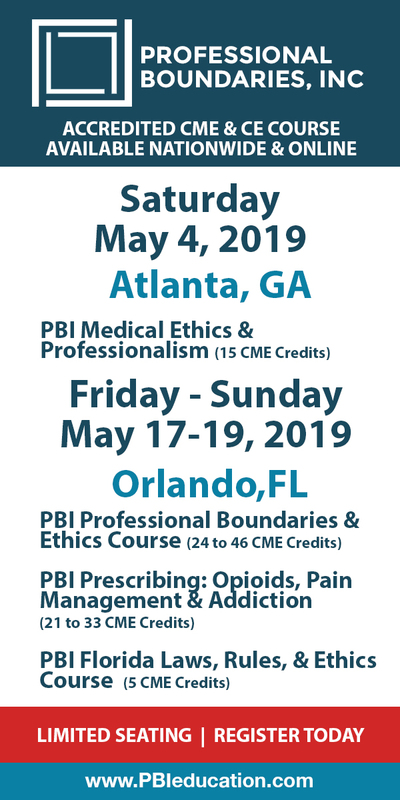 Course Goal: Attendees will learn how to create a practice paradigm and develop a practice congruent with chiropractic philosophy, science and art. You'll review concepts and techniques presented in previous seminars and allow refinement and mastery of those skills. Take home the tools to practice with excellence and innovation. Additional details will be posted as soon as they are available. Level 2 Diploma Course in Aesthetic Medicine is organized by American Academy of Aesthetic Medicine (AAAM) and will be held from May 15 - 19, 2019 at DoubleTree by Hilton Hotel Dallas Near the Galleria, Dallas, Texas, United States of America. This CME Conference has been approved for a maximum of 35 AMA PRA Category 1 Credits™. Additional details will be posted as soon as they are available. Borderline, Narcissistic, Antisocial and Histrionic Personality Disorders: Effective Treatments for Challenging Clients is organized by PESI HealthCare and will be held on May 16, 2019 at DoubleTree by Hilton Hotel Dallas - Campbell Centre, Dallas, Texas, United States of America. Target Audience • Counselors • Social Workers • Psychologists • Psychotherapists • Therapists • Addiction Counselors • Marriage and Family Therapists • Case Managers • Nurses • Other Mental Health Professionals Course Description: Join Dr. Gregory Lester as he delivers an intensive workshop and seminar designed to provide you with the knowledge, skills, and abilities to identify and treat your most difficult personality disordered clients. Better understand your clients with Antisocial, Narcissist, Histrionic and Borderline Personality Disorder and make a breakthrough in clinical treatment. • Manage the manipulative and possibly violent Antisocial Personality Disorder in-session. • Overcome the Narcissistic Personality Disorder trait of perfectionism and combat their need to overpower you as the therapist. • Better understand your clients diagnosed with Histrionic Personality Disorder whose intense emotions and need for attention will test your patience and compassion. • Help the Borderline Personality Disorder client deal with their explosive emotions, self-harm tendencies and cravings for chaos. Case studies and video examples will be used to illustrate client symptom presentation, treatment, and management of each Cluster B client type. You will explore various modalities that are effective with antisocial, narcissistic, histrionic, and borderline personality disorders, such as Motivational Interviewing, Cognitive-Behavioral, Interpersonal, and Dialectical therapies. Each of these theories will be explored to provide you with solid and useable skills to include in your daily practice. Objectives: • Determine how the changes with the DSM-5® impacts diagnosis and treatment of the Cluster B Personality Disorders. • Identify and diagnose clients with antisocial, narcissistic, histrionic and borderline Personality Disorders to effectively inform your choice of treatment interventions. • Utilize case studies to differentiate symptom overlap, effective treatment and emotional management of each Cluster B Personality Disorders client type. • Manage the manipulative and potentially violent behaviors with your clients diagnosed with Antisocial Personality Disorder in session to make therapeutic progress. • Implement CBT techniques to clarify behaviors, values and goals with clients diagnosed with Narcissistic Personality Disorder. • Incorporate techniques to decrease explosive emotions, self-harm tendencies and cravings for chaos for clients diagnosed with Borderline Personality Disorder. • Utilize MI and DBT techniques with clients diagnosed with Histrionic Personality Disorder to help manage cognition and improve emotional regulation. Additional details will be posted as soon as they are available. TexMed 2019 Meeting is organized by Texas Medical Association (TMA) and will be held from May 17 - 18, 2019 at Hilton Anatole, Dallas, Texas, United States of America. Additional details will be posted as soon as they are available. Level 1 Certificate Course in Aesthetic Medicine is organized by American Academy of Aesthetic Medicine (AAAM) and will be held from May 17 - 19, 2019 at DoubleTree by Hilton Hotel Dallas Near the Galleria, Dallas, Texas, United States of America. This CME Conference has been approved for a maximum of 21.00 AMA PRA Category 1 Credits™. Introductory course in Aesthetic Medicine for physicians wanting to expand their practice. Topics include: Chemical Peelings, Botox, Dermal Fillers and Lasers. Hands-on experience as well. Additional details will be posted as soon as they are available.